The Doppler effect is a change in frequency of a sound due to motion of the source of sound or motion of the listener. In the animation below, the sound source is moving toward Observer B and away from observer A. Observer B will hear a higher frequency sound and Observer A will hear a lower frequency sound. An Acoustic Doppler Current Profiler (ADCP) uses the Doppler shift to measure currents in the ocean. An ADCP can calculate speed of the water current, direction of the current, and the depth in the water column of the current. 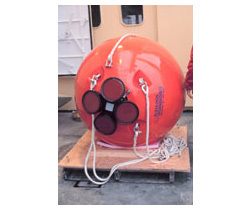 This instrument can be placed on the seafloor, attached to a buoy, or mounted on a boat. Deploying an upward looking RDI acoustic doppler current profiler on a mooring along the Ross Ice Shelf in the Ross Sea. NOAA Photo Library, Photographer: Michael Van Woert, NOAA NESDIS, ORA. An ADCP works by sending out high frequency pulses in a narrow frequency band. A small range of frequencies is used to minimize interference and signal noise. These signals reflect off small particles in the water such as bubbles, fine silt, or plankton. A hydrophone will listen for return echoes in the narrow frequency band and these return echoes will have a change in frequency due to the Doppler shift. This shift in frequency can then be used to calculate the speed and direction of the current. How is sound used to measure currents the ocean?